Recharge Area: Only a few successful traces have led to Greer, from the northwest near Pomona, and the south in the immediate area. Top outlet is a cave stream which sumps; bottom outlet are vertical slots which are too narrow to negotiate. Occasionally, during extreme drought the upper outlet goes nearly dry. Such was the case in November 2001, when the spring was down to 1/3 its average flow. 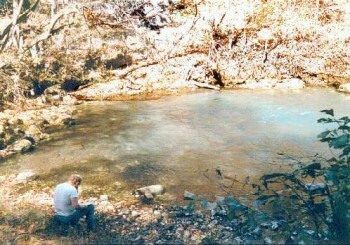 Interesting Information: Greer Spring flows from two outlets 300 feet apart at the bottom of a steep ravine. The branch drops 62 feet in its 1.25 mile run to the Eleven Point River, one of the steepest gradients of a major stream in the state. The water is so powerful that boating is prohibited. The branch has been the site of two deaths, one of a boater prior to 1932 attempting to canoe the waters, and the other of Lewis Greer, son of the prominent mill builder, who was knocked to his death on the rocks of the branch during mill renovation in 1884. Brief History: Homesteaded by Thomas Simpson in 1845. Samuel Greer and his father purchased 40 acres in 1859, and had a mill operating in the gorge by 1860. While the younger Greer was serving with the Confederate troops, other Confederates burned the family mill. Mill was rebuilt after the war, and expanded in 1870. Because of the steep grade, oxen were trained to haul grain up and down the hill without a driver! Increasing demand for milling, but no room for further expansion forced Greer to rebuild his mill 3/4 mile away, atop the ridge, and convey power by a series of cables. 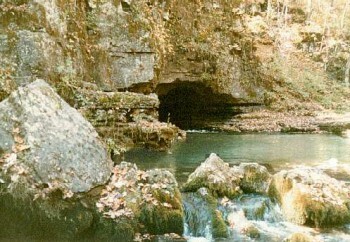 Around 1900, Greer (then called Big Ozark) was thought to be the largest spring in the state. Milling ceased in 1920. Property was owned and used as a family retreat by Louis Dennig family, 1922-1988. After efforts to establish a water bottling plant, property was sold to U.S. Forest Service in 1993. Ownership and Access: U. S. Forest Service. Day access by hiking only along a .9 mile trail, signed on Missouri Hwy. 19. Area surrounding and including Greer Mill for exclusive use of the Dennig family until 2013.